Drama/Musical/Family, India, 1957, 172 min. Synopsis The film begins with the finishing of a water canal to the village set in the present. 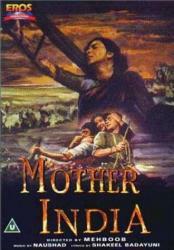 Radha (Nargis), as the 'mother' of the village is asked to open the canal and remembers back to her past when she was newly married, mirroring the new independence of India. The wedding between Radha and Shamu (Raaj Kumar) was paid for by Radha's mother in law who raised a loan from the moneylender, Sukhilala. This event starts the spiral of poverty and hardship which Radha endures. The conditions of the loan are disputed but the village elders decide in favour of the moneylender after which Shamu and Radha are forced to pay three quarters of their crop as interest on the loan of 500 rupees. Whilst trying to bring more of their land into use to alleviate their poverty, Shamu's arms are crushed by a boulder. He is shamed by his helplessness and is humiliated by others in the village, deciding that he is no use to his family he leaves and does not return. Soon after this, Radha's mother in law dies. Radha continues to work in the fields with her children and gives birth again. Sukhilala offers to help alleviate her poverty in return for Radha marrying him, but she refuses to sell herself. A storm sweeps through the village destroying the harvest and killing Radha's youngest child - the villagers start to migrate but decide to stay and rebuild on the urging of Radha. The film then skips forward several years to when Radha's two surviving children, Birju (Sunil Dutt) and Ramu (Rajendra Kumar), are young men. Birju, embittered by the exactions of Sukhilala since he was a child takes out his frustrations by pestering the village girls, especially Sukhilala's daughter. Ramu, by contrast, has a calmer temper and is married soon after. He becomes a father but his wife is soon absorbed into the cycle of poverty in the family. Birju's anger finally becomes dangerous and, after being provoked, attacks Sukhilala and his daughter as well as violently lashing out at his family. He is chased out of the village and becomes a bandit. On the day of the wedding of Sukhilala's daughter, Birju returns to take his revenge. He kills Sukhilala and takes his daughter - but Radha, who had promised that Birju would not do harm, shoots Birju who dies in her arms. The film ends with her opening of the canal and reddish water flowing into the fields.